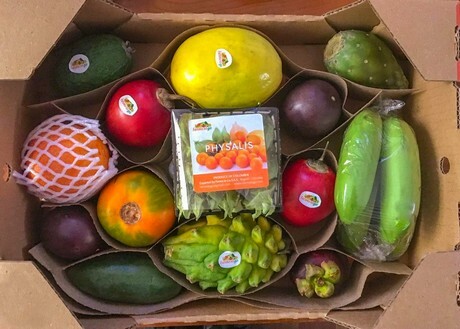 In anticipation of Chinese New Year, Las Vegas-based Terra Exports introduced a colorful 'Fruit Mix' box featuring more than a dozen different tropical fruits grown in Colombia. While the company initially thought about having the Fruit Mix available for the Chinese New Year holiday, they have now decided to offer it year-round. "We introduced the Fruit Mix about a month ago," said Ana Milena Pereira of Terra Exports. "The principal idea was to make it available for Chinese New Year as one of the traditional gifts of this holiday is a box of fruit. However, we will now have it available year-round because it is ideal for any holiday or festive occasion." As mentioned, the Fruit Mix features exotic fruits from Colombia, including Feijoa, Granadilla, Uchuva (Physalis, or gooseberries), Lulo, Gulupa (a type of passionfruit), Mangosteen, Tamarillo, Higo (fig), Maracuya (passionfruit), Pitahaya, Curuba (or banana passionfruit) and Bananito (a type of small banana). It was first available in Europe, with the idea that consumers can be introduced to fruits they would otherwise not normally buy. "Our retail partners in Europe had the same idea to carry the Fruit Mix year-round," Pereira shared. "It is presented in a visually-colorful display box and provides consumers a chance to sample new fruits. The market for the box is Europe, the Middle East and Asia. We are not able to ship it to North America at this time because some of the fruits have not been approved for import into the region." Pereira added that the composition has been carefully selected and designed. "All of the fruits are grown in Colombia all year round," she said. "If you notice, we don't repeat the same color on the same line. This helps to make it visually appealing to consumers. We are also in the process of changing the box design." One of the inspirations for creating this Fruit Mix was to highlight and celebrate fruits from South America. With this in mind and with the feedback received, Terra Exports is currently organizing for more Fruit Mix boxes from other countries, including Guatemala and Ecuador. "We are developing new boxes because we have so many different and interesting fruits to show to the world," Pereira explained. "We want to share with the world what South America has to offer. Over the next few months, we are working to introduce a Fruit Mix from Guatemala - which will be available in North America - as well as one from Ecuador, each with fruits that are specialties from their respective countries."